Honor Earth Day by learning how to combat global warming in your home landscape and vegetable garden. The program begins with the award-winning documentary, dirt!, followed by practical tips from Tamson Yeh of Cooperative Extension of Suffolk County. Cinema Arts Centre 423 Park Avenue, Huntington. Sponsored by Gateway Community Garden with support from the Townwide Fund of Huntington. Salt of the Earth Seed Company is unique because the seeds we sell you come from our own farm, Invincible Summer Farms. The seed is in turn used by our farm in fresh production. We go through a rigorous trialling period before things go into seed production. We are pleased to be offering our heirloom tomato, eggplant and pepper plants once again! All seed we offer is currently being grown by Invincible Summer Farms in Southold, NY. Future partnerships with other seed producers will also have farm of origin labels because we believe you should know exactly where your seed is coming from. Are you facing any tomato troubles about now? Well, there is help to be had, from Dr. Meg McGrath, a longtime vegetable pathologist for Cornell University. Plus a handy app! Missing from the discussion is: Do not heavily seed and allow all plants to grow. This makes controlling the infestation and the harvest more difficult! Colorado Potato beatles have been spotted in the garden eating tomatillo plants! 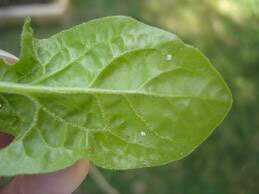 Many of you have expressed concern over your spinach plants that appear to be drying out. I’ve done a little research and it looks like what we have here is a Spinach leaf miner. Removing infected leaves prevents the larvae from pupating, burrowing in to the soil and returning later as egg-laying adults, which starts the cycle of damage over again. 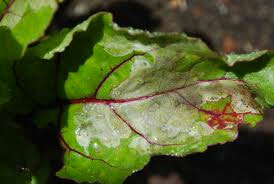 This will be especially in important for long-standing plants like Swiss Chard. If you have the time an inclination, crushing those eggs on the undersides of leaves will limit hatching. Control weeds. Destroying the insects’ wild food plants should also be helpful in reducing the numbers of leafminers. This includes lamb’s-quarters, chickweed and nightshade in and around the garden Control in beets: Beets are typically not sprayed for leafminers except if leaves intended for consumption are infested. Use horticultural oil, or neem oil. Some products require a longer number of days between application and harvest; check labels. Control in spinach: If needed when mines appear and, if necessary, at seven-day intervals thereafter (check label directions), apply neem oil, or spinosad. Note: a multipurpose product with insecticidal soap and sulfur should not be used as noted on the label; it damages spinach. I hope this is helpful…. Spinosad will do less leaf damage then Neem. It is available labeled for other insects. I use Bonide’s Organic Potato Beetle spray available at Home Depot. Spinosad is made from the residue from bacteria in the production of Rum and is safe to use up to harvest. If you use Neem, spray it on a few test leaves to see if it affects the leaf and makes them unpalatable.